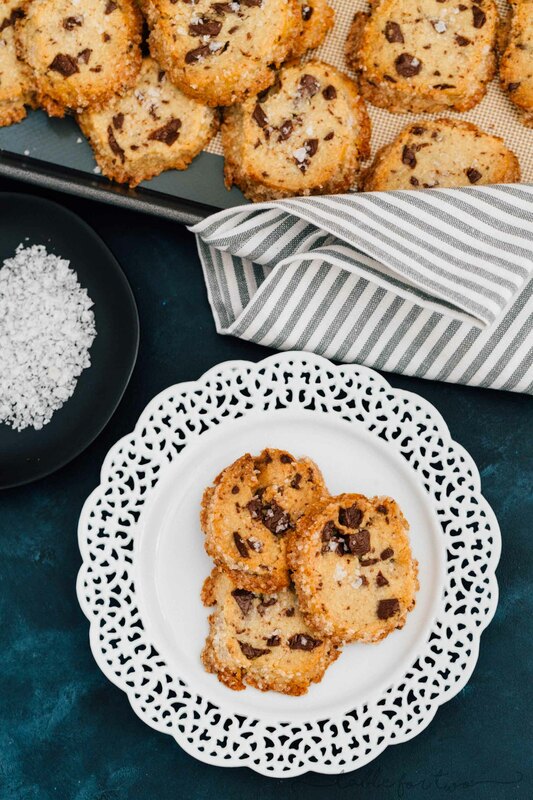 These salted shortbread chocolate chunk cookies by Alison Roman took the Internet by storm last year. I think I was one of the last people to make this recipe. It certainly won’t be the last time I make this though! I personally think it’s because of the combination of the loads of butter and salty/sweet. 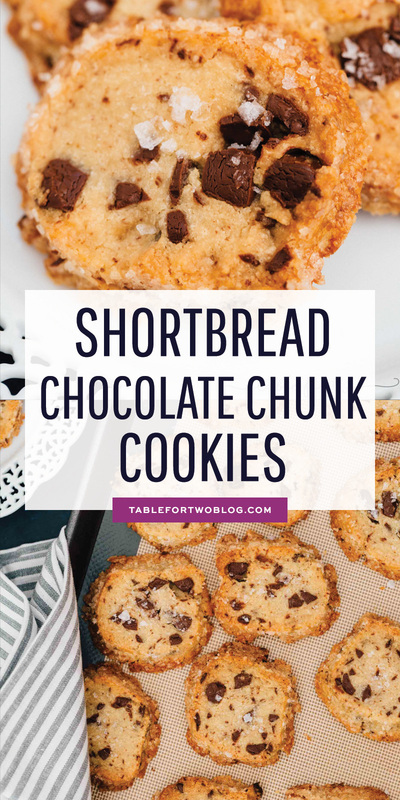 The shortbread base is so different than any other cookie out there. It’s like a crunchy shortbread. What is the consistency of the dough? It’s thick because it’s a shortbread, essentially. Do I seriously have to use that much butter? If you’ve ever made shortbread, you’d know how much butter is involved with shortbread! Do I have to use salted butter? I only have unsalted. 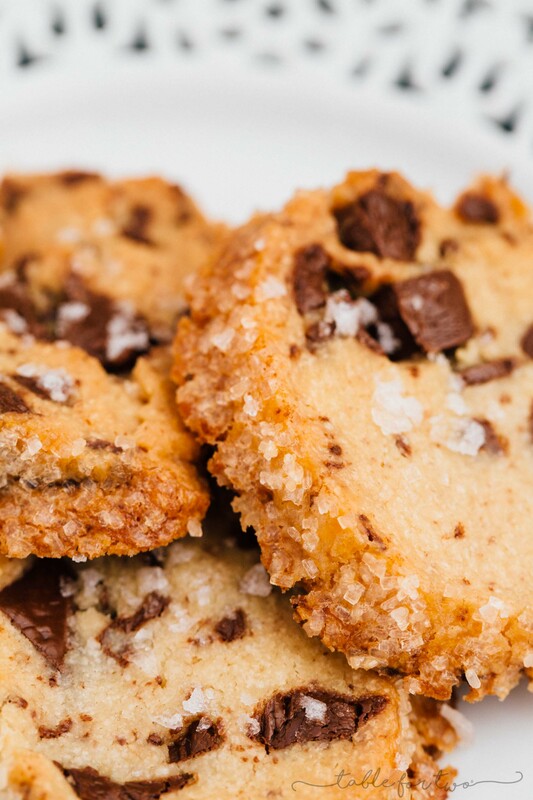 If you don’t have salted butter, that’s okay but in this case, baking with salted butter would be best for this shortbread recipe. If you only have unsalted, add in 3/4 teaspoon of kosher salt. Specifically Diamond Kosher salt and not table salt. Do I have to brush it with an egg? Yes! It is what helps the browning on the edges but most importantly gets the sparkling sugar to stick to the dough. What if I don’t have sparkling sugar to roll the dough in? You could do sprinkles! But the sparkling sugar really does give it that extra sugary crunch. Do I have to chill it for at least two hours? It helps the flavor develop but it also hardens the dough enough so you can slice and bake them. The shape you slice them and place them on the tray is basically how they will be when finished baking. Can I add in any other topping? I would stick to the recipe. After all, this is for a chocolate chip cookie! 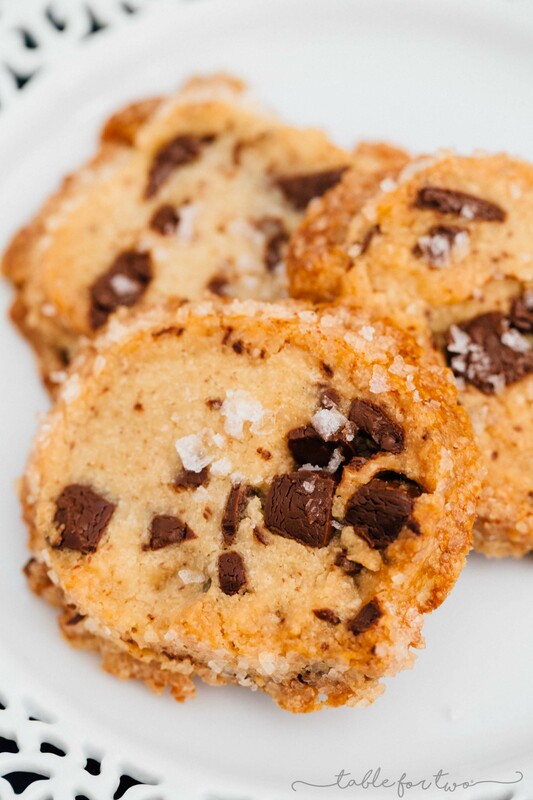 Do I have to sprinkle flaky salt on top? 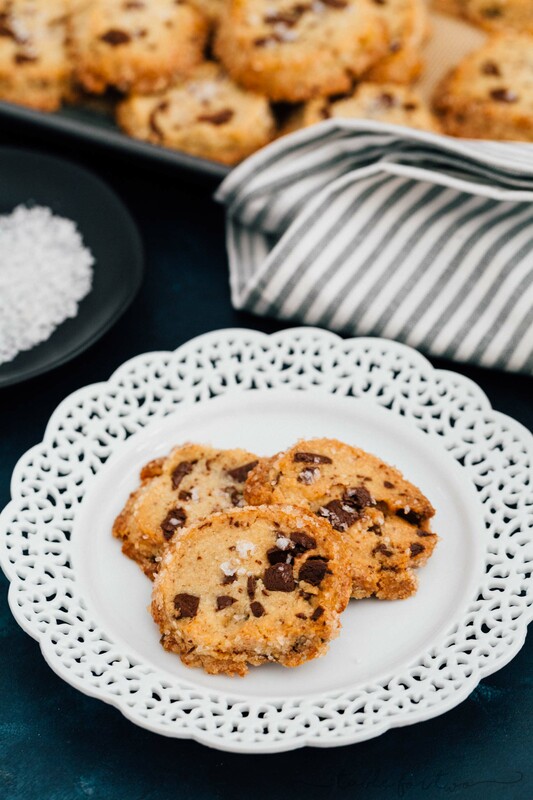 No one is saying you *have* to do anything but it will elevate this cookie and Maldon sea salt on top is always a good idea! Yes! It’s encouraged actually since you have to chill it for at least two hours. You can keep it chilled for several days, too. I made the dough on the weekend and then sliced and baked later that week. Yes! Just defrost it in the fridge. 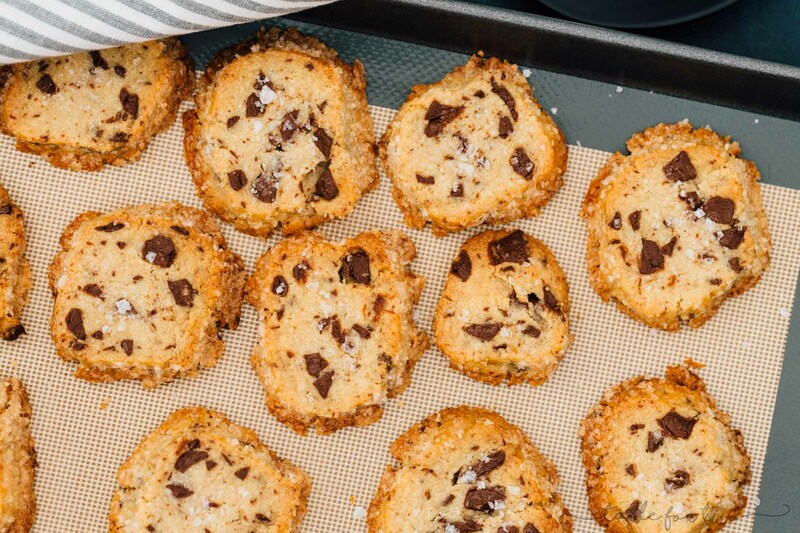 Seriously, go grab that glass of milk and all the ingredients and bake these up! 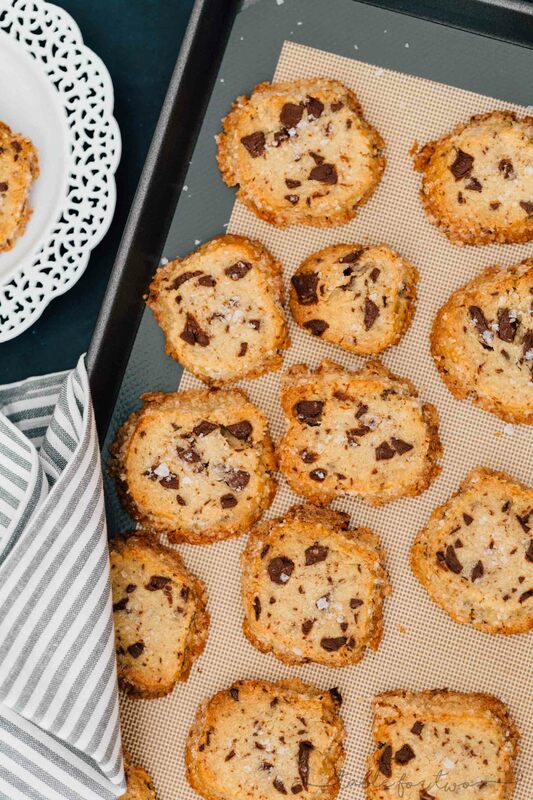 They are SO good and a different kind of cookie that will have you hooked! 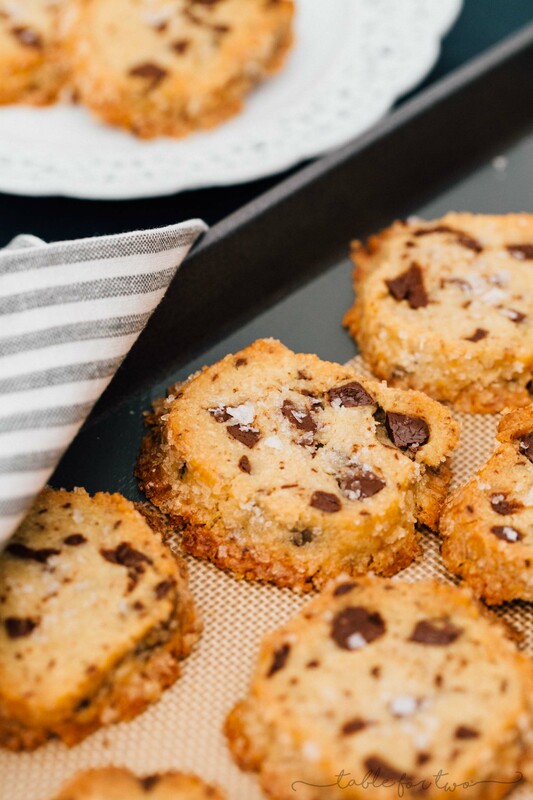 These shortbread-based chocolate chunk cookies are unlike any other chocolate chip cookie you've had before! In the bowl of stand mixer fitted with the paddle attachment (alternatively you can also use a mixing bowl with an electric mixer), beat butter, sugars, and vanilla on medium-high until super light and fluffy, about 3-5 minutes. Scrape down the sides of the bowl with a spatula. With the mixer on low, carefully add the flour then the chocolate chunks. Beat just enough to blend. Divide dough in half then place each half on a large piece of plastic wrap. Fold plastic over to cover dough and to prevent your hands from getting all sticky. Using your hands, form dough into a log shape. Each half should form logs that are 2–2 1/4" in diameter. Chill until firm, about 2 hours. Preheat oven to 350 degrees Fahrenheit. 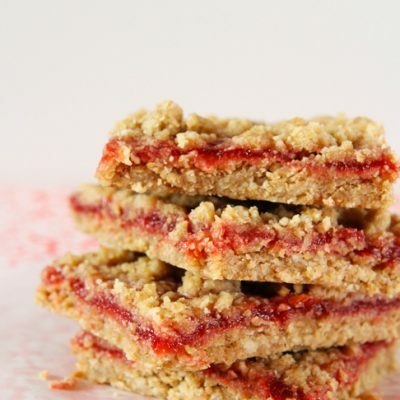 Line a rimmed baking sheet with a silicone baking mat or parchment paper. Unroll the logs of dough then brush them with the egg on all sides. Sprinkle and coat the logs in sparkling sugar and gently pat them to get them to stick. It's okay if it's not totally coated. Slice each log about 1/2"-thick rounds. Place on prepared baking sheet about 1-inch apart. Sprinkle with sea salt. Bake for 12-15 minutes, or until the edges are just beginning to brown. Let cool on baking sheet for 5 minutes then transfer to a wire rack to cool completely. Cookie dough can be made 1 week ahead. You can tightly wrap them in plastic wrap and chill, or freeze up to 1 month. 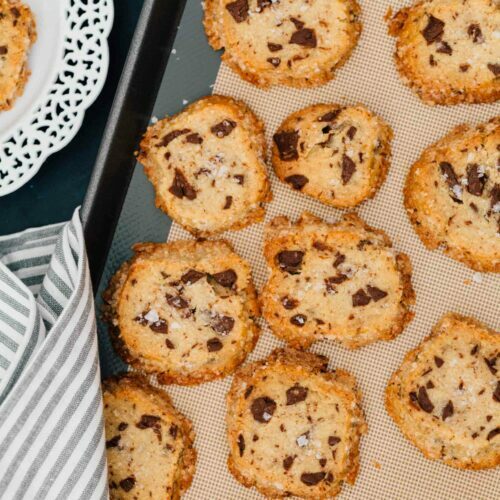 Cookies can be baked 5 days ahead. Store in an airtight container. From Alison Roman's Dining InBon Appétit featured on . Made these cookies. Everything you said about them is so true. I followed recipe to the tee and it’s a keeper! Thank you for all your great and varied recipes! I did not have Sparkling Sugar so used Turbinado Cane in place. Delicious. Great substitute! I’m glad you enjoyed! 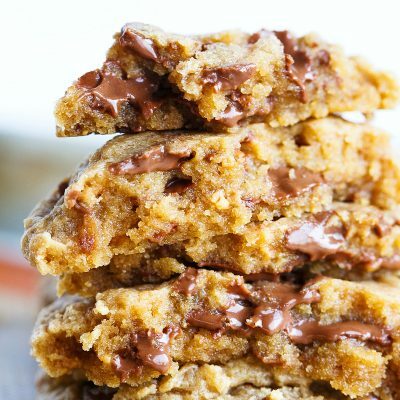 Simply the best cookies I’ve ever baked! The recipe says that it makes 16 cookies. This is not accurate. The correct count is 32 as described at 2 1/4 wide and 1/2 inch in thickness. 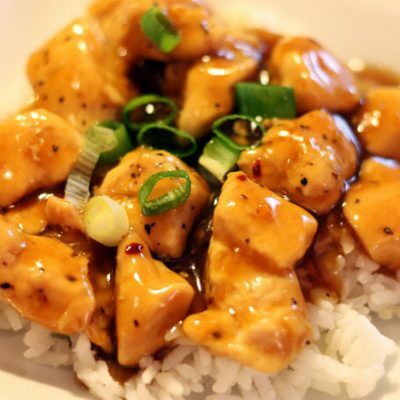 This recipe is a definite keeper! This looks so good! I bet they are great to dunk in coffee! Thanks for sharing! They would be nice to prep ahead of time and having waiting in the freezer for guests! Good cookie the day made, great cookie the next day! So buttery & chocolaty!